Emily made this ball. I am so proud. My kids make a lot of things. The vast majority don't end up being shared on this blog because I can barely keep up with photodocumenting the process and outcomes, let alone writing prose about them. 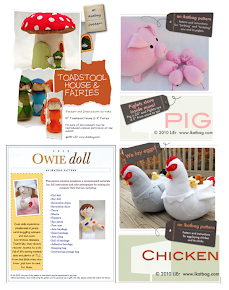 But, funnily enough, these girls enjoy seeing the work of their hands on Mom's blog. They think it's a big deal. And I am proud to share them. But there is a part of me that still (naively) believes there you can have a craft life outside the internet, outside blogs, outside instagram and Facebook - you know, like in the old days when you crafted simply because you enjoyed the making, and didn't give two hoots about the validation? Sometimes I deliberately keep crafts off the blog just to feel that again, just so I can say, "These crafts are ours, and we made them together one rainy afternoon and they are too precious a family memory to let the internet turn them into some stranger's goal on Pinterest." It's a funny thing, the internet. It brings people together like nothing else, and delivers information that would otherwise take years to find, let alone consolidate into an hour's worth of reading. But it has no boundaries. And it's like one of those two-way mirrors in the line-up rooms at police stations: you never know who's reading what you wrote, and what they're thinking about it. Scully put it best when she said, "The internet's not good for you, Mulder!" Ain't that the truth? Gotta love the X-Files. But this project of Emily's - she's made five already - I want to share it today because I looked at these little patchwork balls and I saw evolution. It's no secret that my hope for my children is that they will want to learn to sew, and that they will learn to sew without patterns. By that, I don't mean that they should end up exactly like me, and not even know how to use a commercial pattern. I do mean that I hope they will not be dependent on commercial patterns, without which they'd feel unable to make stuff. Sewing, after all, is a means to an end - the end being the ability to not just make, not just adapt, but create. 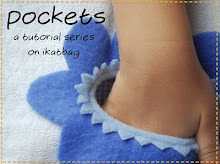 While thinking about how to teach my kids to sew, I wondered about the sequence and approach: skills first? Visualization first? Hands-on first? Machine first? Hand-sewing first? Project-based? Patternmaking-based? Drafting vs. draping? Teacher-oriented? Learner-driven? I can't count the number of times I've found myself thinking, "Er, we have a free afternoon. Nobody's doing anything. I should probably initiate a sewing lesson. Maybe one of the girls would like to hand-stitch a flower (or something dead easy)." Then the moment passes because someone suddenly shouts, "Let's play Village!" or "I'm going over to the Johnsons' now, Mom!" And off they run, and I wonder if I'd just let another opportunity slip by. I've found that children live by a different timeline than adults. When the time is wrong, nothing we do can make them learn. But when the time is right, it's like they never needed a teacher - they pull it out from inside themselves, all the things they've observed and listened to when you thought they weren't aware you were even on the planet, let alone trying to tell them things. I'm writing this overly-flowery post today to share this with you, friends: be prepared to be surprised by your children, and by the power of their creativity. Let them go, and don't teach them too much. When they're ready, they'll floor you. My Emily - she's eleven - is a dabbler. She tries everything (except squid, although we plan to rectify that in Singapore soon). And if she finds a friend who dabbles in similar things, they are soul mates. Recently, she made a new friend in class who sews, which thrilled her to no end. 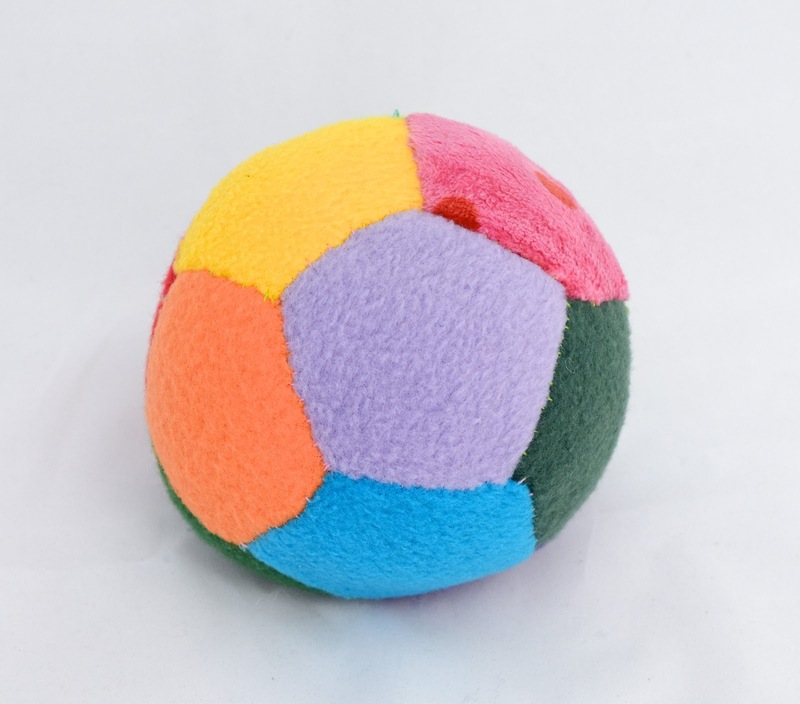 This friend, she said, has made a patchwork ball from odd-shaped scraps; can she do the same with our scraps? Well, duh! True, I wasn't entirely convinced that odd-shaped scraps could successfully become a sphere, but perfect geometry was not the point in this particular exercise. Some hours later, we had Prototype 1, an adorable little peapod of a ball. I have no photos of that for you because, as we said earlier, some things are precious and we want to keep them that way. Emily used the whipstitch - apart from the running stitch, it was the only hand-stitch she knew at the time. There were very few seams to sew, because she used very few pieces of scraps, not fully visualizing at the time that more scraps = larger internal volume = more likely to approximate a fully symmetrical sphere. Most pertinent was this takeaway from Prototype 1: Emily figured out that by turning the finished ball (pre-stuffing) inside out, so that the whipstitched seams were now on the inside, the seams looked neater. She then decided that the inside of the ball was now going to be the more polished-looking outside of the ball. Suddenly, and without me drilling stuff into her head, she'd discovered the significance of RS and WS, and how to place pieces together in a seam to assign one surface as one or the other. 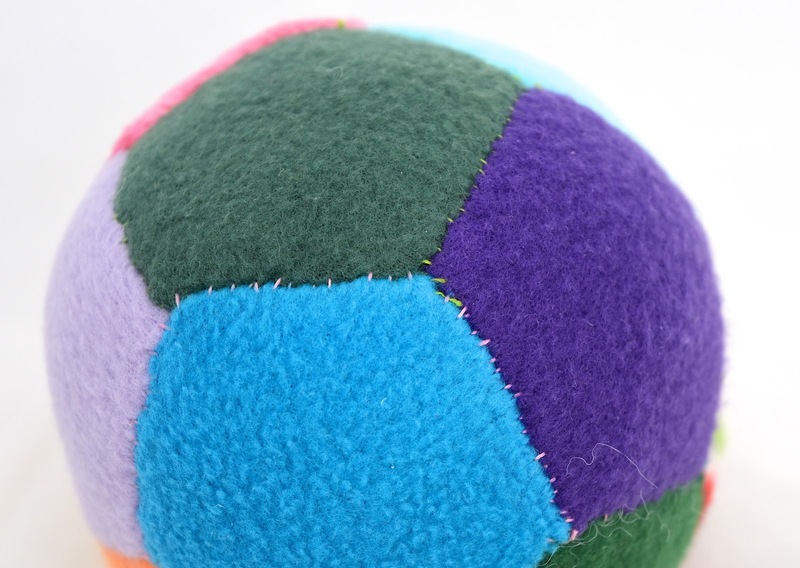 Then in my random web browsing, I discovered Abby Glassenberg's lovely pentagon patchwork ball tutorial. I loved that it perpetuated from a polygon - a ready-made bona fide geometrical DIY pattern, with all-straight sides, something Emily could totally generate herself. Children at this age don't like to be told what to do, see. Creatively, I mean. They are on a roll and the universe is one huge endless inventive possibility to them. They do not need mothers to tell them how else to do things that they're already enjoying perfectly well, thank you very much. This mother, however, loves spheres more than any other shape in the world (because they are superior, period), and makes it her personal mission to educate other people on their supreme perfection. So we made her a kit. Jenna did, actually. And it sat in the pile of What Fun Christmas Gifts I Got This Year. Until Kate made her astounding blanket-stitch mini-donuts. "Mom," said Emily, "can you teach me the blanket stitch too?" I did, and we used the pentagon pieces from that kit. And Emily sewed them all together with blanket-stitch, painstakingly joining the seams from corner to corner, until she had a ball. She turned everything RS (or WS, depending on what your reference surface was) out, leaving the blanket-stitched raised seams on the inside, and stuffed her finished project. I wish I could've captured the look on her face when she realized she had a ball, and that it looked this good, and that she'd produced it by assiduously stitching and not giving up. Then, suddenly perplexed, she said, "But when I sew up the opening after stuffing, we'll see the blanket stitches again! Is there another kind of stitch that we can use that's neater?" Two stitches in one project. None of which I initiated the teaching - or even the suggestion - of, as if I were the Guru of Most Appropriate Stitches For Any Given Situation. "I love this so much!" Emily declared. "I want to keep making more! And give them to my friends! And my kindergarten teacher is having a baby and I can give her one!" Ah yes, mass producing mania. Our family is genetically predisposed to that condition. "But!" Emily continued, "it will take too long. I want to use the machine." But there are corners in those balls! 120 degree obtuse angled corners that somehow need to meet at neat tri-colored junctions! We haven't covered that in our SuperAmbitious Homeschool Sewing Curriculum! Nor threading a sewing machine or winding a bobbin or troubleshooting tension or sewing with knit fabrics and stretch direction or anything like that yet, either! Good thing I was too busy preparing supper to voice those thoughts and be a wet blanket that night, because the girl dragged the IKEA sewing machine upstairs, figured out how to thread it, and sewed a ball. I let her run with it - her colors, her fabrics (she attempted fake fur knit and survived), unpicking bad seams, incorrect threading, bobbin case insufficiently pushed into its socket, what happens when we run out of thread in the bobbin, seam easing, loose lightbulb, accidentally-disconnected machine cord ("the machine's not working anymore, Mom!!!! "), unsuitable stitch length, the whole hog. If she needed help, she called for it; if not, I let her be. 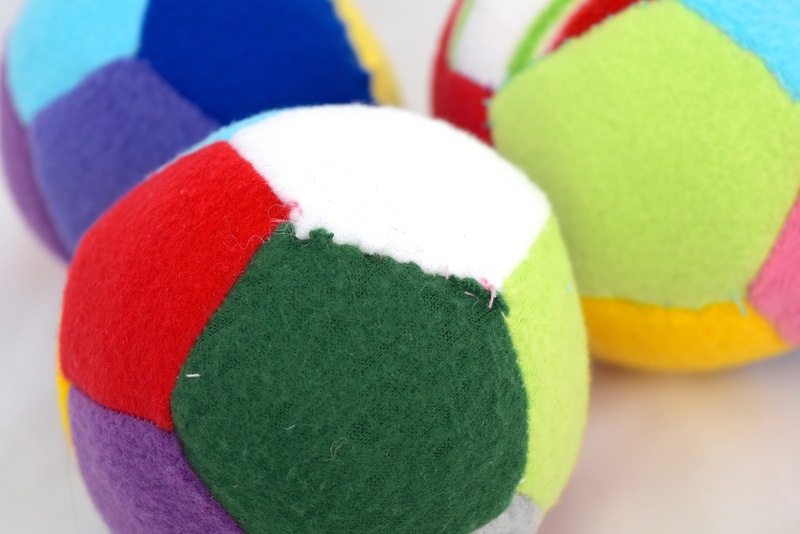 She knew how to put together the different pieces of this patchwork ball with a sewing machine because hand-stitching the first version helped her visualize how the RS and WS and corners worked. She knew how to troubleshoot the sewing process because she ran into all kinds of funky and we fought those fires when they happened. I didn't have a curriculum. Hilarious moment, just minutes into sewing her first few seams: Emily announces, "I think the machine's broken, Mom. It's making a really strange sound." We both listen, and then I fight back a laugh. "It's not broken. That, Emily, is the sound of a $60 machine when you've been used to a $600 one." I think I know what to get her for her 12th birthday. Not because it would be a Useful Thing For Every Child To Have, but because she's outgrown the one she's already using. 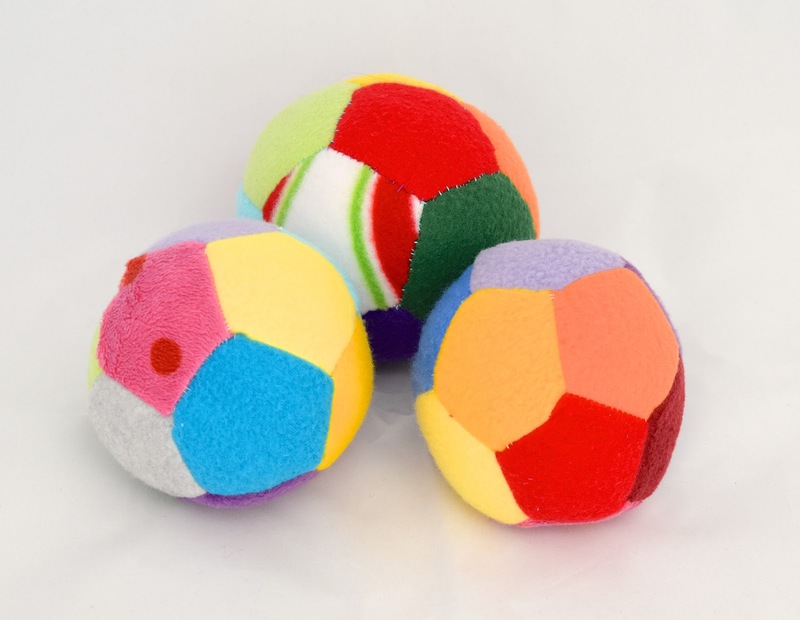 Long story just to show a few pictures of patchwork balls, huh? Funny. Every time I think I am so on top of things as far as crafting with my kids goes, something like this comes along and reminds me of how little I know about how kids learn. And how little I really need to instruct. I'm relieved! Are you relieved, too? It's not as daunting as you think, friends - teaching your kid to sew, to make a pattern, to create. I'm proud of what my kids make, yes. But I'm prouder of how they teach themselves to do it. And I am proudest when they get to that moment when they can visualize what they want to make, and sync their hands with their minds to make it happen. That is creating. It's all about the pathways between dreaming and translating. And once they know the pathways, the world is truly limitless. What a lot of lessons right there in one project! I can just imagine the wheels turning in that brain of hers - Emily is a great figure-it-out-er! And what beautiful results. Mom, you've taught her well... by not teaching her too much and letting her thinking and creative mind do the work. Pats on the back to you both! Thank you, GG! Maybe Courtney might like to make some of these balls, too? Sure would be a good way to chase the winter blues away. I loved this post so much! My mom was not a crafter and when she had me she was kind of worried and a little sad that she wouldn't be able to teach me any crafts, or knitting or whatever. Few years later she was relieved to find out that I just about taught myself anything I wanted to learn! And that was before one could watch a YouTube tutorial on just about anything! So yes kids are masters at learning! And I need to remind myself when I get in the homeschool funk of "are we learning enough??? I need to figure out how to teach them more structured lessons! " and then one of the kids walks in and says something genius like the 3 that they figured out themselves (like the 3 year old one day sat there staring at her fingers saying 'mom, 2 and 2 is 4!' and I go "na, I just have to relax and let them learn"
I homeschool because I was bored out of my mind in public school. Anything that interested me I learned instantly by just glaring on the page once. Anything I had no interest in, no one could teach me. The stuff I loved I still remember until today. Sorry I am rambling, I just really loved your post on how children learn! lydia.purple: heavens, no - not rambling at all! I loved reading your comment and about you+your mom and now you+your kids. Till this day I do not enjoy Chinese - I did not enjoy learning it in school because it was taught by rote, with absolutely no connection to culture at all. Shame. I guess they figured that since we were Chinese by ethnicity, there was no need to tie a language to every other aspect of the culture it belonged to. Big mistake. I'd love to be able to go back in time and opt out of Chinese lessons so that today as an adult I might be unrepulsed enough by it to be interested to learn it. You go, homeschooling teacher! I always wonder at how people say "homeschooling mom." Not the same, I'd think. Totally different roles. Overlapping in execution, yes, but distinct enough to each have their own philosophy and approach. You? You're proud? I'm a bit teary eyed over here and they aren't even my kids. Congrats. You done good and clearly so did the girls. Enjoy!! annie dee: Awwwww. Thank you! Joyous. Amazing. Some tears when reading as a sewing Mama. And art teacher. Thanks! You are a patient, wise and wonderful mom. I wish you could teach us parenting skills along with our bag lessons. What a beautiful story!! Kids have a lot to teach us as we learn how to parent them... It's an amazing process! I love how you want to keep something precious away from social media. Such riches! Such wonder! As a mom who makes stuff, I thank you. Teaching and letting go and learning from the student. Hard, worthwhile, hard. I really appreciate your sharing the work you do, and as a mom, I deeply appreciate keeping things private, and sharing things on the internet. I learn a lot from your work, and I thank you. And I really love the homemade kit, with the hangtag on the bag. SJ Kurtz - "Teaching and letting go and learning from the student. Hard, worthwhile, hard." Isn't that the truth, though? And yet, we do it, whenever we see that it's working with our particular kid (who may not be the same as another kid), and are extra motivated when grace allows us to see it working. Yes! Some things are too precious not to be kept private! Thank you for your sharing. Technical stuff (learn a lot from you) as well as your life. It's so good to be reminded once in a while that curiosity and creativity is laid into children (and humans in general). They learned to walk and talk without us telling them how to, and so they can learn other stuff just the same way. Sometimes we have to intervene and teach them, but I believe mainly we teach them a lot just by the way we're living. It's such a great thing being a mom, creating a pathway for our kids and their creativity. You're doing well! God bless! Regula: So right, you are - the number of things our kids learn in spite of us is staggering. And some things they've learned we only know on hindsight, so we just have to trust that we're on the right track and keep doing it, because only time will tell. Thank you for your kind words! I really enjoyed this. 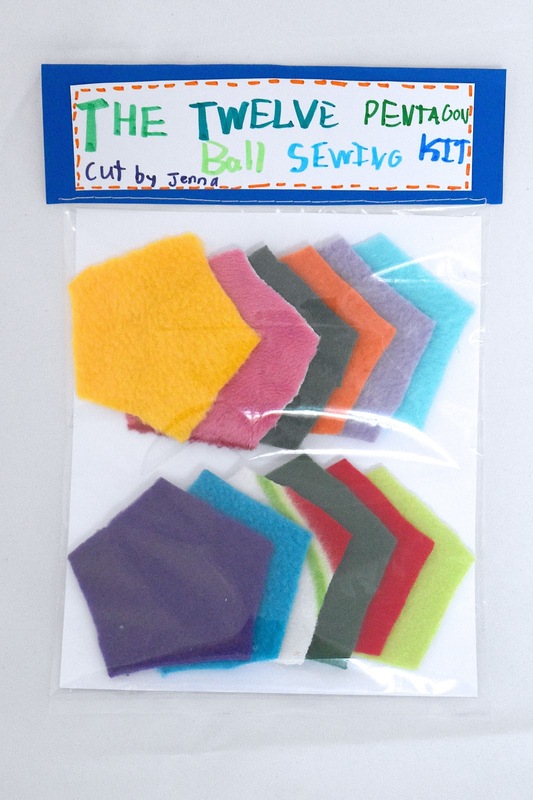 I have a four year old (boy), who is very interested in sewing, really everything, and as he gets older and more able to do things on his own, I am always glad to read how to help my kids develop a love of learning and figuring things out. I like the kit idea as well. I am in awe of Jenna's kit. I agree with not sharing everything on the internet. Thank you so much for sharing! I was just thinking about this over the weekend, as my 5-year old and I had a slight meltdown in the sewing room. I wanted to teach her all about drafting and seam allowance and the "correct" way to do things. She wanted to have fun with fabric and needles. I really do need to relax and let her have fun. I just tend to get excited and forget who I'm talking to, I guess.